The only way I could survive 8 hours in a row without eating is when I am sitting in the lecture of the very difficult class I am taking at SFU, which is exactly what happened today. That class is so difficult that I manage to temporarily lose my appetite and forget about the fact that I am actually starving. When I got out of class, I was so famished that the only place I wanted to go was an all-you-can-eat sushi restaurant. One of the closest available choices was Kingsway Sushi (I wasn't exactly craving Kawawa, which was in fact closer). 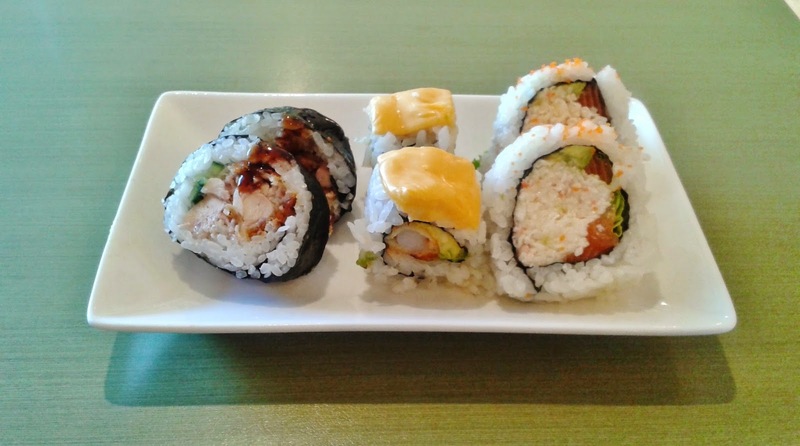 Kingsway Sushi is a Japanese large restaurant situated on the Northwest corner of Kingsway and Boundary Rd. 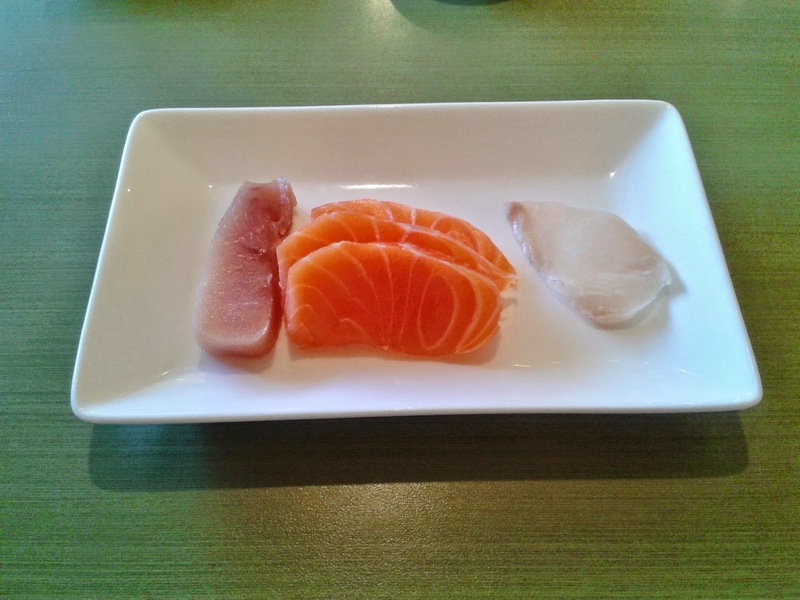 At $25.95 for the standard (non-deluxe) all-you-can-eat menu, Kingsway Sushi is one of the higher-priced all-you-can-eat places in Vancouver. Well, no worries - as long as the food was also higher quality than other all-you-can-eat places, I would walk out satisfied. Note: The items on some of the dishes have been re-arranged to clearly show all of the items on each dish and to reduce the number of pictures needed to display all of the food. At Kingsway Sushi, the food comes out exceptionally fast. After just mere seconds of placing my first order, the sashimi arrived. The Tuna Sashimi was served unusually warm and had a rather strong metallic taste. The Salmon Sashimi was slightly better, and would pass for freshness. Most of the Salmon Sashimi was soft (with the occasional tough piece), but felt a little segmented, starting to fall apart at the white lines. The Tai Sashimi was the best of the three, sliced thinly with a tender interior and slightly tougher edges. The Wild Salmon Nigiri was served with extraordinarily warm sushi rice, which managed to overwhelm the salmon. The wild salmon did not have the segmentation issue of the regular salmon, but was not very rich in flavour. 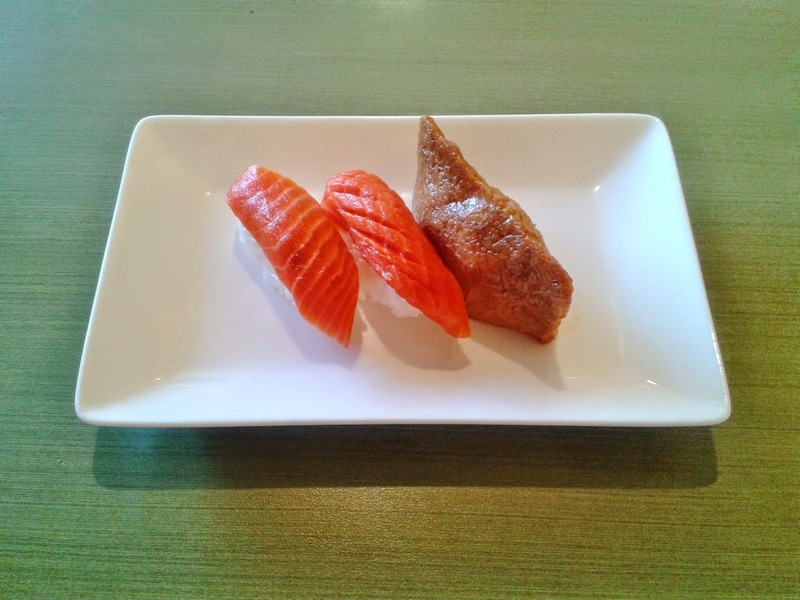 The Inari Nigiri, on the other hand, was soft, sweet and tasty. 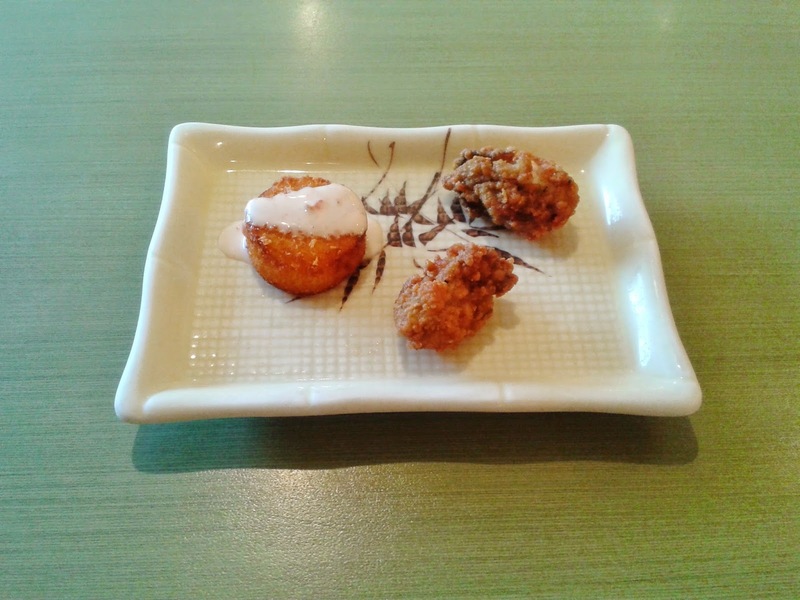 The sauce on the Deep Fried Scallop is similar to a non-spicy version of chili mayo. The exterior was lightly crunchy, but the oil seemed overused. The imitation scallop was chewy but not tough. I enjoyed the Popcorn Oyster, which had a good balance of texture - a crunchy exterior layer covering the very soft oyster inside. The batter did not mask the taste of the oyster, which was another plus. 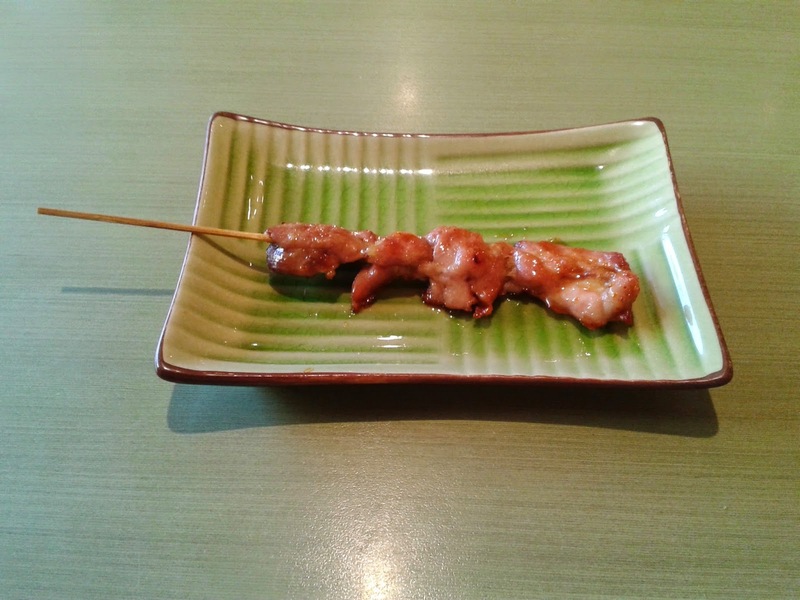 I was pleasantly surprised that the Chicken Brochette did not end up in disaster (after all, there are many à la carte restaurants that falter on chicken skewers). The chicken was neither tough nor tender, but was juicy and adequately seasoned. I found the sauce just a tad too gingery. 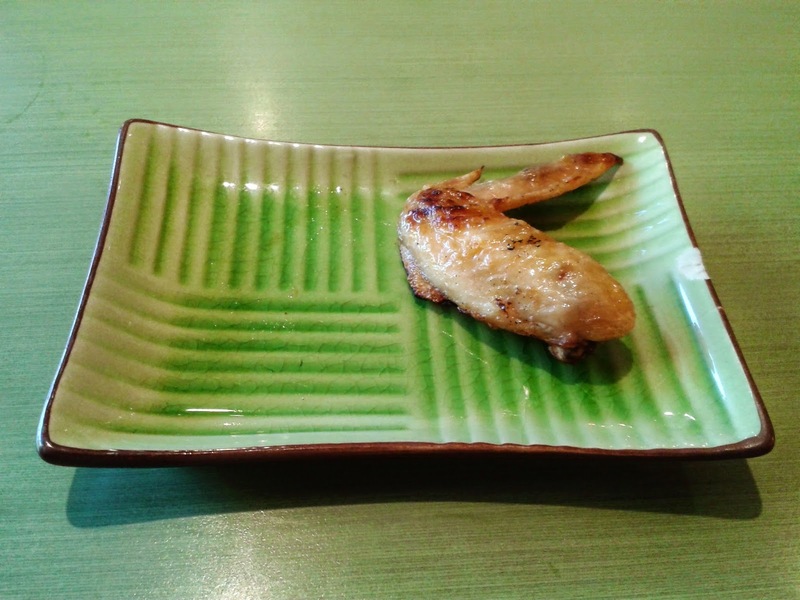 The Chicken Teriyaki Roll had very densely packed rice, and as such, the chicken became an aftertaste rather than the main taste of the roll. I also found it a little strange how the roll was served cool. The Spicy Cheezy Dynamite Roll was slightly more successful and came one minute after I ordered it, even though it said on the menu that it would take 10 minutes to prepare. I enjoyed the shrimp, avocado, and spicy flavouring in the middle of the roll, but there was no effort to integrate the processed cheese, which felt like an outcast. Perhaps using the nine extra minutes I could have waited to melt the cheese would be a good idea? The Alaska Roll contained a lot of crab and some salmon. The crab meat was rather creamy and soft. Overall, I did not have anything special to say about this roll. 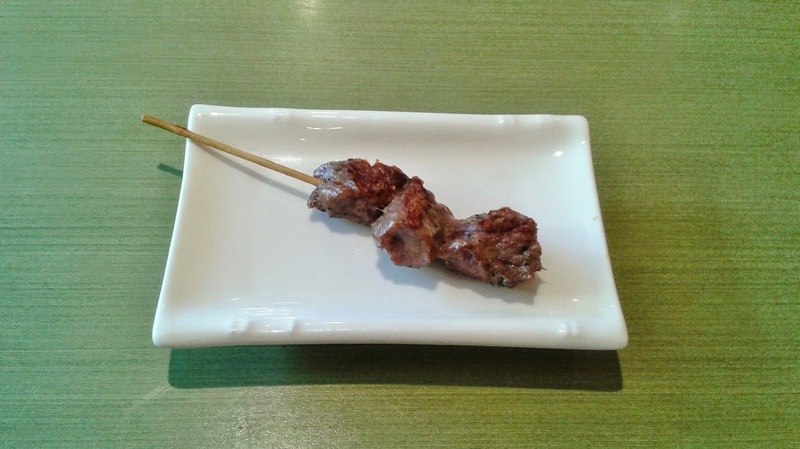 This New York Steak on Skewer is a disgrace to New York Steak. The steak was extremely tough and not adequately seasoned. Despite being very tough, it still managed to make me feel like I was eating fat - I didn't even know that was possible. 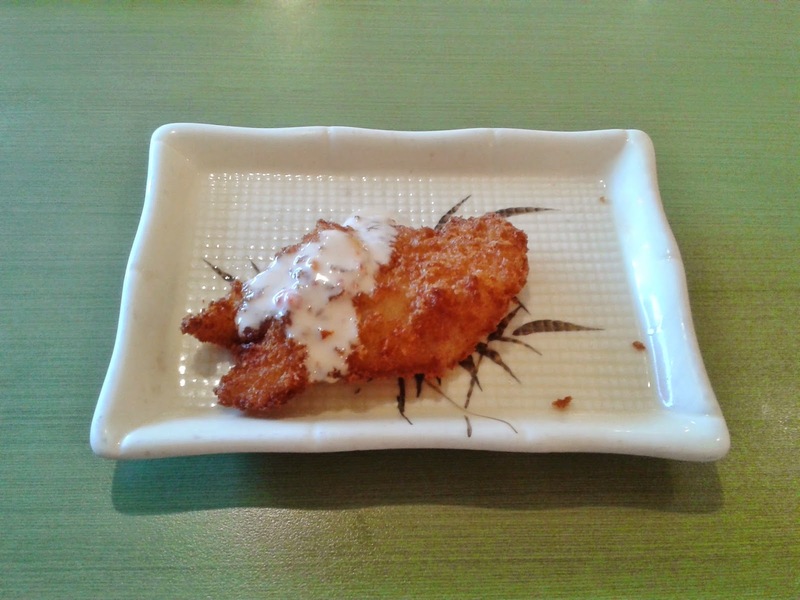 The Deep Fried Sole was dressed in a Caesar-like mayonnaise sauce, with a soft, tasty fish fillet inside. It was like a good but over-fried piece of fish and chips. 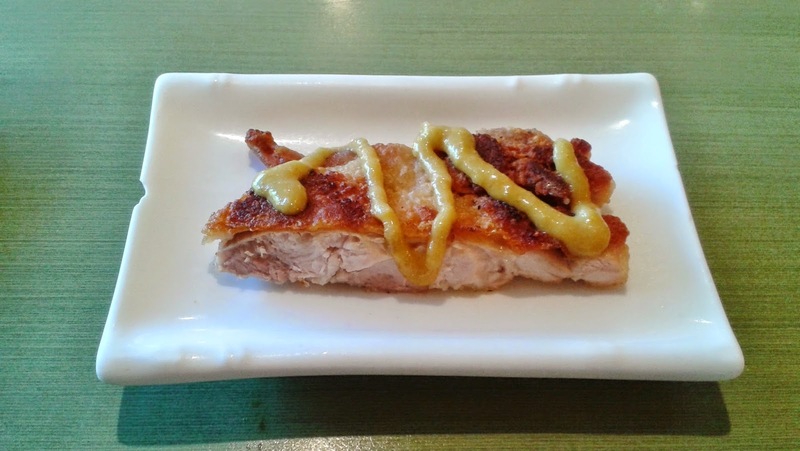 The Honey Mustard Chicken certainly wasn't one of the brightest moments of my meal tonight. The chicken was bland and the sauce on top was too sour and tasted like some mutant version of curry - I can't even put it into words. There was a half-sodium version of soy sauce that came with my tempura. The Tempura Prawn had too much batter compared to the prawn, which was too small. The flavour of the prawn was okay. The Tempura Yam was quite soft and sweet, but had an unfortunate batter clump, which I wouldn't have minded if I could scrape it off easily. It didn't come off easily though. The Tempura Salmon had quite a bit of salmon in it. 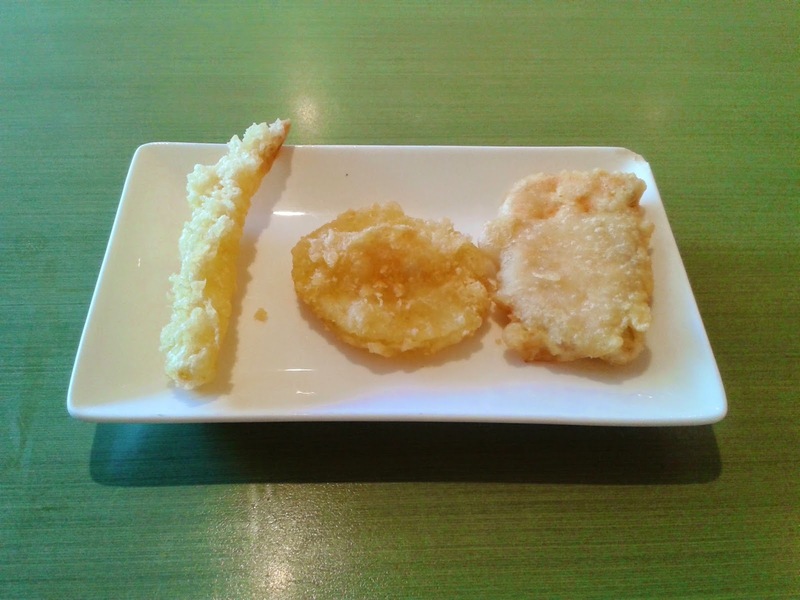 This piece of tempura would fare much better with some dressing or sauce as it was rather dry and lacking in flavour. 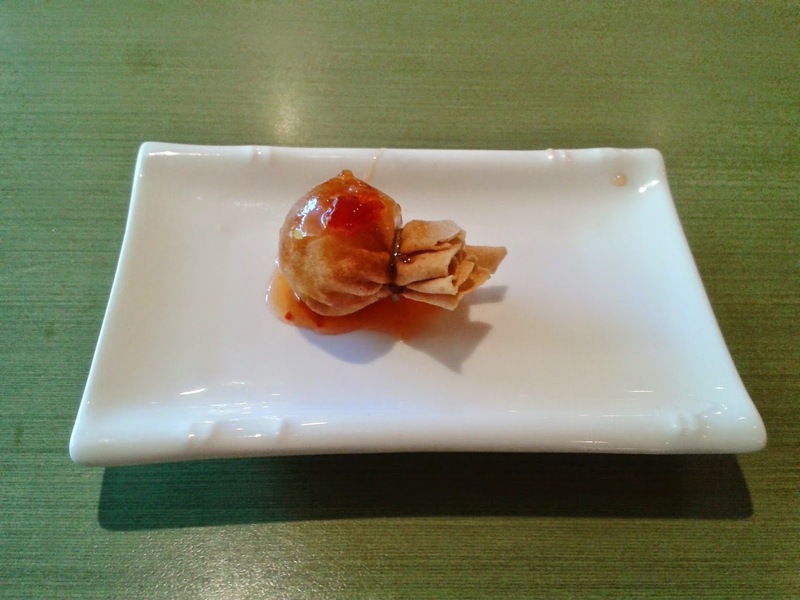 The Oyster Motoyaki contained a tasty oyster which lacked a smooth texture. Both servings of motoyaki were quite heavy on the oil. 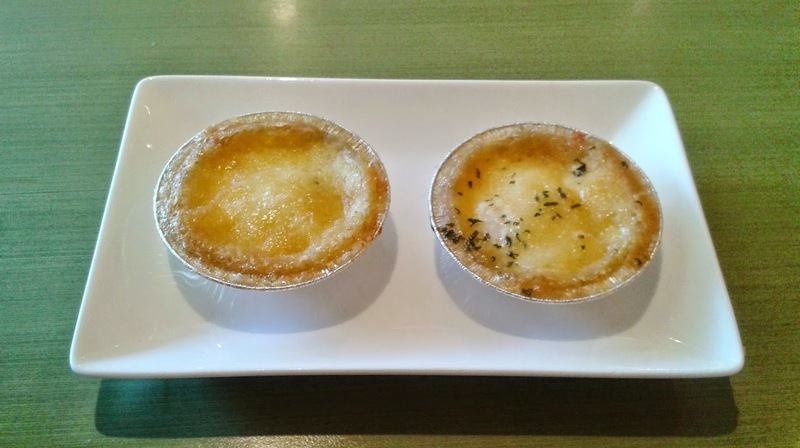 The Seafood Motoyaki was marked with some haphazardly placed herbs and contained mainly salmon with a small scallop inside. This would have been nice if the salmon wasn't chopped up into such small pieces. 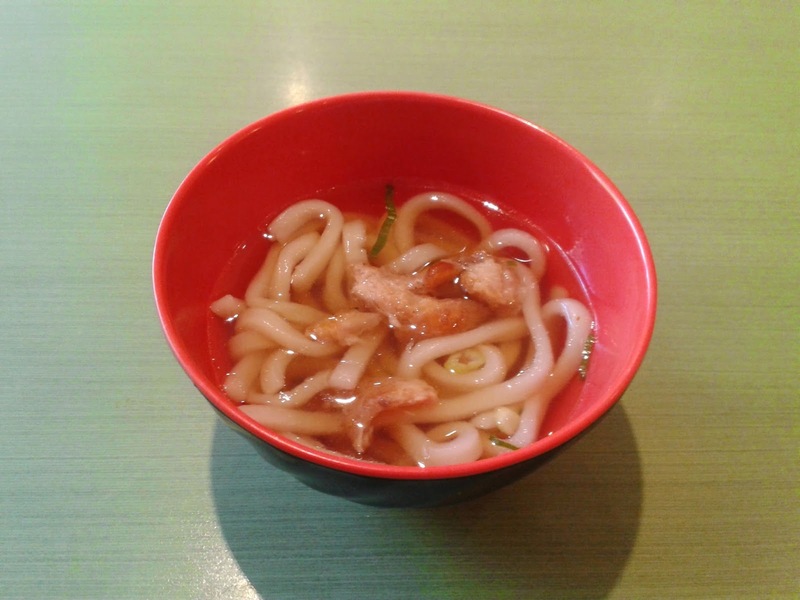 The Chicken Udon had a nice, light dashi broth but the chicken tasted like it was covered with flour. The udon is what I would call the opposite of al dente - the noodles were one of the softest I have had for udon noodles. I really liked the inventiveness of the Deep Fried Shrimp Bomb, which was a bomb-shaped spring roll with shrimp added to the filling. The outside exhibited a nice crunch and the inside was savoury with the addition of the shrimp. The BBQ Chicken Wing was well-seasoned, but a little too greasy. The edges were a bit charred but the rest of the skin was okay. I would have preferred the chicken to be a little more smooth, as it tasted a little like misplaced white meat. I had a hard time picking what to have for dessert, so I went with my favourite strategy - pick everything! These ended up being thin sushi rolls with a lot of topping stacked on them! I thought they were quite cute. The Scallop Pearl Sundae also had a piece of lychee, which helped the "sundae" taste more sweet. The scallop was sweet, appropriately spiced and served chilly. 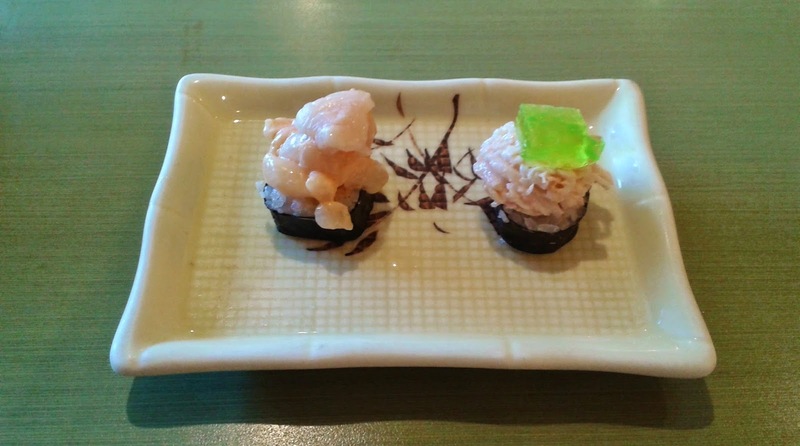 The imitation lobster in the Lobster Delight tasted almost exactly like the crab meat in the Alaska Roll, just with a stronger prawn-like taste. Both puddings would qualify as jelly if only they were a little smoother and had a bit more moisture. Nonetheless, the flavours of each were quite well-defined - the coconut had an obvious coconut taste and the mango had an obvious mango taste. The two darker patches on the mango pudding had a stronger taste but retained the same texture as the rest of the pudding. Both servings of pudding were quite sweet and were a good way for me to finish my dinner. The service I received was quite attentive and all of my items came very quickly. Some of the servers abruptly took my plates away right under my nose, which was awkward, but some of the servers displayed a good attitude. The food isn't stellar, but is above the average for all-you-can-eat. At $25.95, I would have liked to see a little more variety on the regular all-you-can-eat menu. There is a deluxe menu available for $34.95, though with $34.95, I could stuff myself full at a high-end Japanese restaurant.